Whatever your thoughts on taking a perfectly fine SUV and swapping sobriquets and rooflines with a weekend toy, the burgeoning "sports activity coupe" class isn't going anywhere. And finally, a decade after BMW beat everyone to the punch and became a bit of a punchline when it launched the X6 as the first of several SACs (this marks the first and last time we'll use that acronym), the seriously solid 2019 BMW X4 shows the form is no longer a laughing matter. It's easy to poke fun at how the makers of Ultimate Driving Machines have settled into pumping out innumerable turtle-shaped crossovers and high-riding fastback sedans this decade. But the matryoshka doll strategy hasn't been for naught, as BMW has sold over 200,000 X4s worldwide since the becouped crossover debuted in 2014. Now, an engineering overhaul finally gives the next-generation model a real dose of performance to back up that sport-inflected facade. 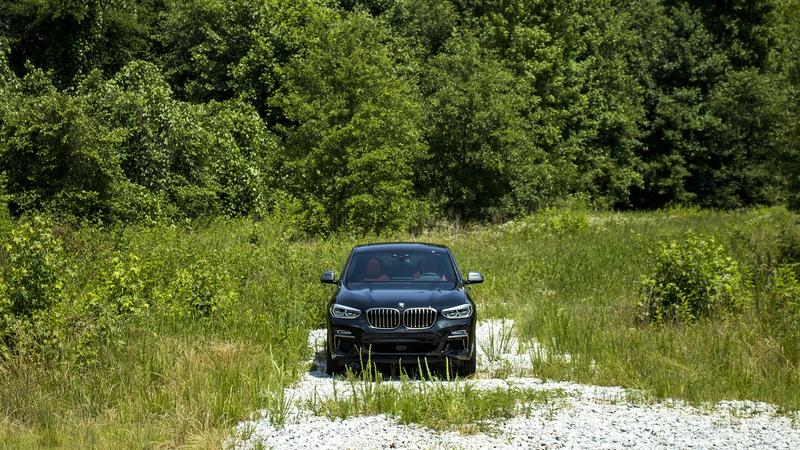 The 2019 X4 doesn't rewrite the laws of nature, and there's only so much a 355-horsepower straight-six engine, a locking rear differential, and an adaptive M suspension system can do to motivate a 4300-pound crossover through the curves. Yet I would challenge anyone to feel the way the X4 tucks itself into a high-speed turn, or hear the way the exhaust crackles and pops when you ease off the throttle, or experience the way that xDrive system can be tricked into an extended drift (more on that later) without cracking a smile. It's a flash of that old-school Bimmer magic in the unlikeliest of places—even if this particular jury is still out on the concept of a slope-roofed SUV. In case you're not up on BMW's naming scheme of late, the mess of new models over the past decade has thrown things into flux. Odd-numbered vehicles (3, 5, and 7) still represent traditional four-door models, while even numbers (2, 4, 6, and now 8) signify either a true two-door coupe or a nebulous four-door gran coupe. Then there's the whole Gran Turismo lineup, which sees the 3 and 6 series morph into higher-roofed fastback versions of the sedans. Confused? So is our Mike Spinelli. But we're here to talk about BMW's X models, where thankfully things make a little more sense. 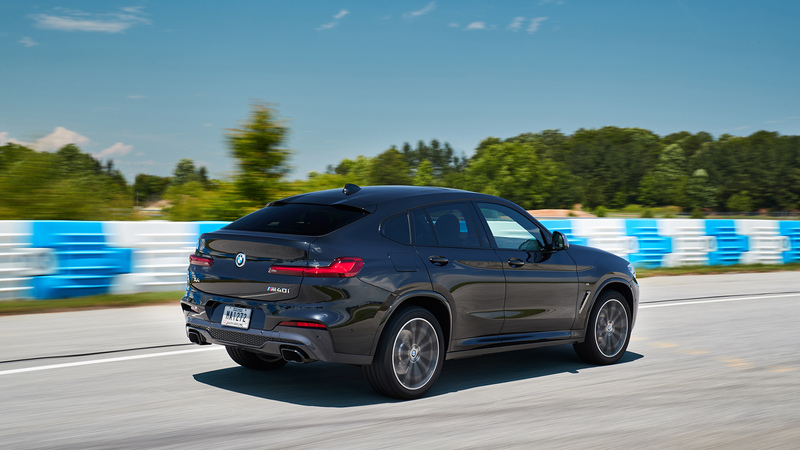 The X4 and X6 are simply the "coupe" versions of the corresponding X3 and X5 SUVs. 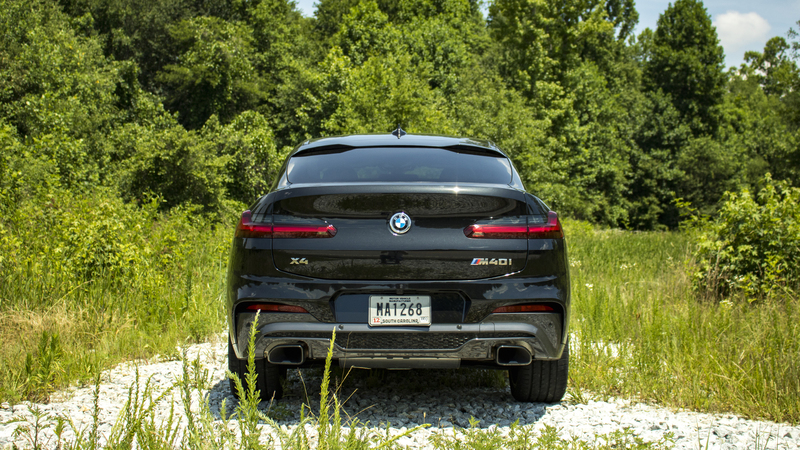 That means choosing between the boxier X3 and nontraditional X4 is more of a stylistic decision than anything else, as they're mechanically identical save for a slightly wider rear track width. So, about that style. Growing 1.4 inches in width and 3 inches in length gives the 2019 X4 a gravitas that its predecessor lacked, while keeping the same height stops it from looking too outlandish. Eagle-eyed observers will notice the two biggest changes are found at the front and the rear, with a larger kidney grille and nicely-redesigned taillights as bookends for the car. The terrapin-esque side profile looks much the same. Overall, it's much more of an evolution than a revolution, which probably won't move the needle if picking something like this over a regular SUV remains the height of illogic to you. But it's a solid update that goes a long way toward dialing back the visual awkwardness that's somewhat inherent in a sports activity coupe. At the very least, it's far, far less brash than the gargantuan X6. 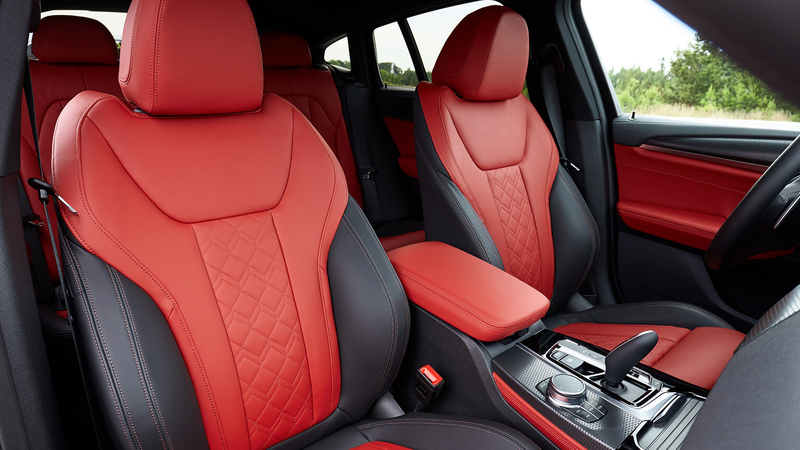 From the front seat, the 2019 BMW X4 looks and feels exactly like the 2018 X3. That means beautifully supportive seats with a new Vernsasca leather option that's simultaneously textured and smooth to the touch, three-zone climate control, a hexagonal motif in the center stack (canted toward the driver, of course), and a crisp 10.25-inch iDrive 6 touchscreen with a 12-speaker Harman Kardon sound system as the sundae topper. In particular, I'm a fan of how the company rigged its digital gauge cluster with physical bezels that give it a comforting structural permanence in the age of screens. Luxurious without going over the top, it's a crisp, clean, comfortable, and decidedly modern space. In other words, it's exactly what you expect from a $60,000 BMW. There are a few missteps you don't expect, however. The X4 gains the company's gesture control technology for the center touchscreen, which ostensibly lets you do things like change the volume, skip a track, or answer a phone call with a few simple hand motions. In practice, it seemed to operate with a will of its own, ignoring direct attempts and interpreting this Italian's conversational ju-jit-su as a cue to randomly jack up the volume to 100 percent on more than one occasion. In its latest iteration, iDrive is a fine piece of kit that mostly avoids the user-unfriendly pitfalls of the past. Mostly. I dug the clear, high-resolution menus and display animations, but I also found the menu layout for changing certain vehicle options was unintuitive to the point of frustration. Most annoying was the discovery that the heads-up display can only be adjusted in a submenu buried about ten layers deep in the system, meaning it's impossible to change while moving. 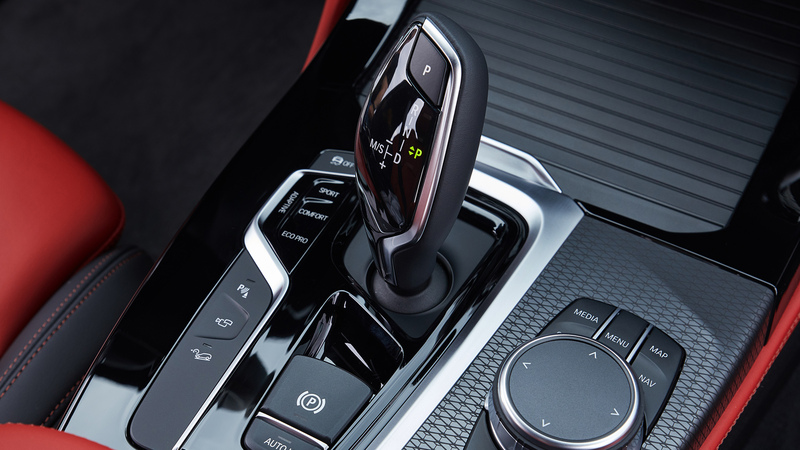 That won't matter if you're the only one driving your car, but considering less-premium automakers have figured out how to make that accessible through steering wheel controls (or better yet, a physical switch), it seems like a miss. 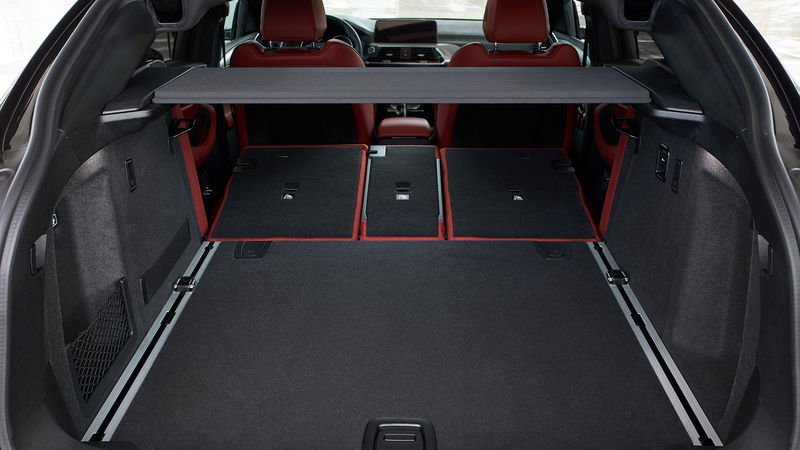 Aside from the sloping roof cutting out 10 cubic feet of cargo space compared to the X3, the new X4 loses 2 inches of rear-seat headroom as well. The sports activity coupe profile also limits rear visibility—so the optional blind spot monitoring and 360-degree camera will definitely come in handy. 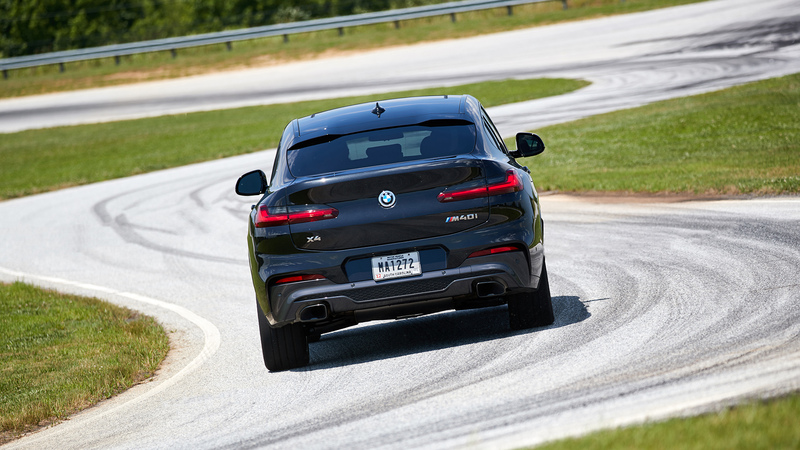 BMW arranged a fittingly incongruous stomping ground for journalists to test the 2019 BMW X4 M40i: the meandering B-roads of rural South Carolina, with a grand finale on the track at the BMW Performance Center that's right across the street from the Spartanburg assembly plant where every single X4 is built. But if seemed odd at first that the company was sending us into a national forest to test a high-performance SUV, things clicked into place at the first turn. Or rather, before the first turn, when I lifted off the throttle to slow down and was rewarded with a hilarious burst of crackles and pops. Distracted by the concerto out back, I failed to brake adequately for the corner. But even as the M Sport calipers and discs did their thing, I noticed that the X4 M40i was incredibly composed through the curve; it felt like the xDrive system was subtly kicking out the rear end and simultaneously sending power to the front wheels to rotate the body into the turn and nail the apex. Steering feel is typically numb for a new car in 2018, but the variable ratio rack is nicely balanced at different speeds and tightens up noticeably as you move into Sport and Sport+ driving modes. 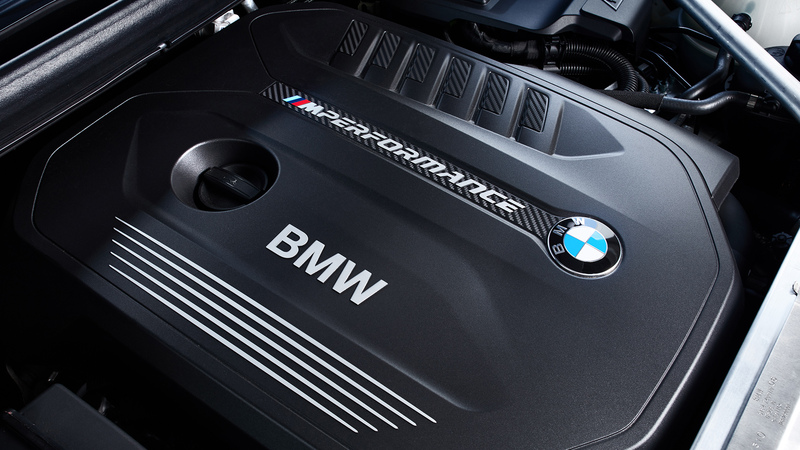 The 3.0-liter turbo straight-six engine in the M40i is a real gem. The 355 horsepower and 365 pound-feet of torque make it feel eminently usable around town and a downright riot on an abandoned secondary road. 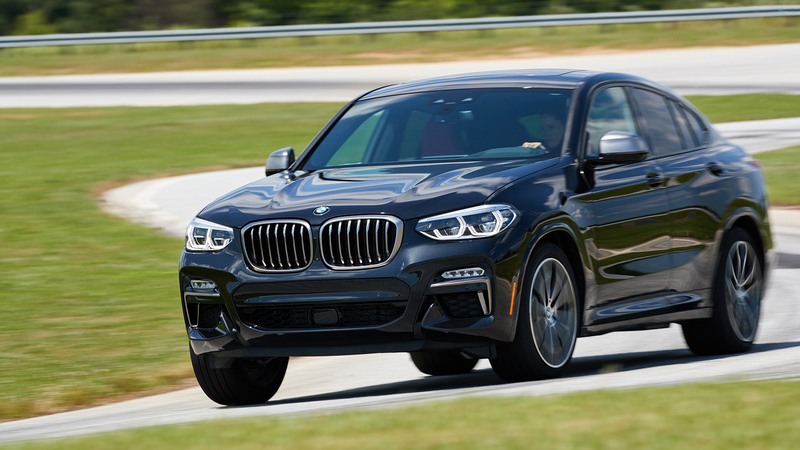 The regular X4 xDrive30i has to make do with a 248-horsepower 2.0-liter inline-four powerplant, and while it pulls strong and won't leave the average driver wanting, it lacks the aural fireworks of the inline-six. 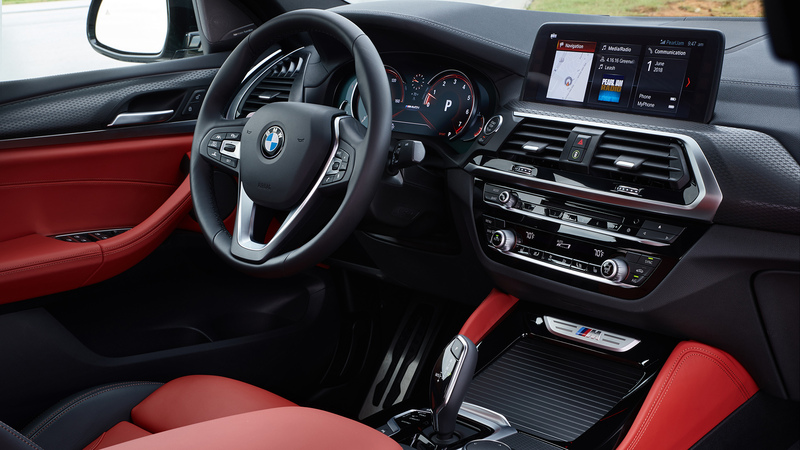 Both are connected to a ZF eight-speed transmission, and BMW continues to atone for the subpar automatics of its past with one of the least obtrusive programming jobs out there. I wouldn't call it lightning quick, but it never once got in the way over three hours of aggressive driving, and the whole powertrain can scoot this sports activity coupe from 0 to 60 mph in 4.6 seconds. Believe it or not, it was an end-of-day track session at the BMW Performance Center that really showcased the X4 M40i's sporting potential. My personal car is a 2004 BMW E46 Touring, so I have strong feelings about the approach BMW used to take to simple, raw performance; when I informed the mötley crüe of German engineers on hand of such, I was met with a level of enthusiasm that would have been surprising from non-Germans. Zat vas one of our best! In particular, they wanted me to note the predictability of the X4 under duress, and how they tried to recapture the ethos of purer cars like the E46. Noted, and observed. Part of that is the 50-50 weight balance, part of that is the lower center of gravity compared to the X3, and part of that is the extensive suspension work that removed a ton unsprung mass even on the non-adaptive models. But credit is also due to the M Sport rear differential—standard on the M40i—which can progress from limited-slip to fully-locked when you turn off Dynamic Stability Control and really boosts mid-corner handling. It also makes it a relative cinch to slide (on a wet skidpad, at least) despite lacking a full-on drift mode like the one found in the new M5. Those of us in the automotive Greek chorus may gnash and wail at the thought of consumers driving anything other than a station wagon with a manual transmission, but out there in the real world, people make these kinds of decisions on instinct, on impulse, on emotion all the time. And so while the X4 may not offer much over the X3 aside from that funky profile, style is really all it needs to justify itself. Remember how General Motors sold approximately three different cars under eight brands before its bankruptcy last decade? 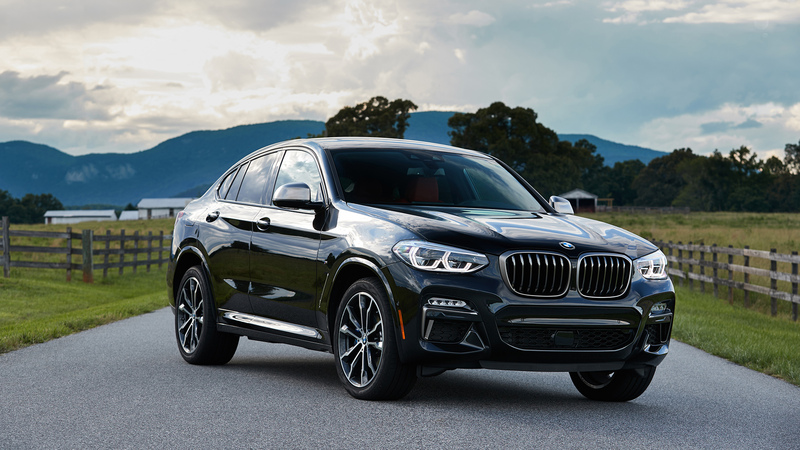 Thankfully, the 2019 BMW X4 is no mere exercise in badge engineering, and its emergence as a semi-potent performance piece comes at a perfect time for the company. It may have invented the sports activity coupe segment, but with entries like the Mercedes-Benz GLC Coupe and the Porsche Macan raising the bar and giving consumers choices they never knew they wanted, it needs to stay fresh and start living up to the "sports" part of its oxymoronic name. 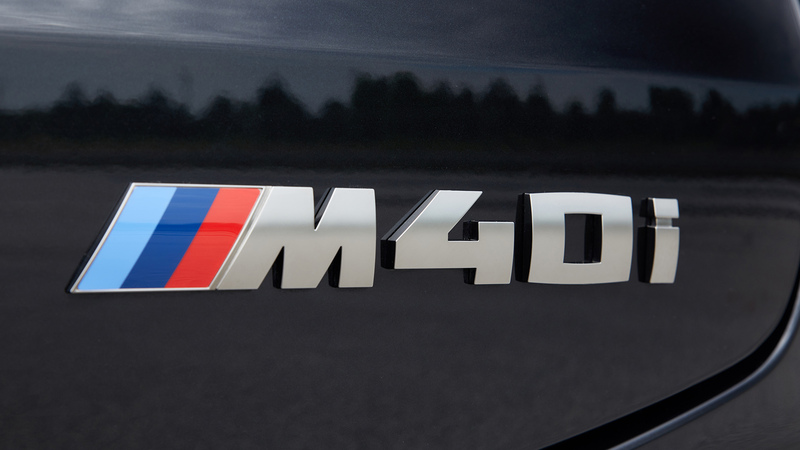 While most buyers will undoubtedly gravitate toward the $51,445 X4 xDrive30i, it's really the M40i version that stands up and offers one of the most surprising blasts from the past I've experienced in a while. A crossover coupe is the last place I expected to catch a fleeting glimpse of the soul of my old E46, and while that feeling only lasts as long as the next sweeping turn, it's undeniably present. You can argue over the looks, but you can't argue with this feature set. After a 20-year hiatus, the 8 Series is finally returning to the United States as BMW's flagship coupe.